I am very proud to have been a brand ambassador for Little Alf for 2017 and with Christmas on our doorstep, I thought this would be a great time to mention some of their fantastic gift ideas and let you know a little bit more about Hannah and Little Alf. I find the story of Hannah and Little Alf really inspiring. I have always enjoyed writing and telling a good story. 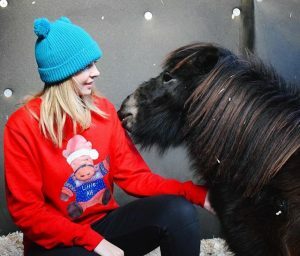 After building up a large following online telling her stories of her best friend Alf, the miniature shetland, at just 17 Hannah published her first children’s book! Since then she has managed to write 4 more books as well as writing regular columns for the Yorkshire times and creating a strong equestrian brand. It is amazing what she has been able to achieve at such a young age and her hard work has not gone unrecognised! It really has been a fantastic year for team Little Alf with plenty of exciting events such as opening their first shop and meeting HRH Princess Anne, receiving an award for her hard work for riding for the disabled. 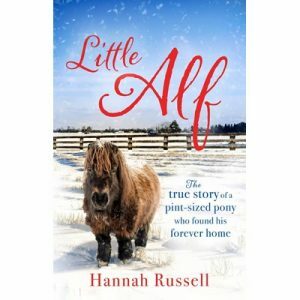 Last month she won the Young Equine Writer award at the prestigious Equus Film Festival in New York for her latest book Little Alf – The True story of a pint sized pony who found his forever home. I find it amazing how much she has managed to achieve with Alf, especially when you look at me and Scottie bumbling blindly through life! And now as promised, my Christmas Gift picks from the Little Alf shop! Little Alf – The True story of a pint sized pony who found his forever home. This award winning book was only published a few months ago and has done amazingly well. Within the first week it made Amazon’s Best Sellers list and recently won an award at the Equus film festival. It has received amazing reviews and I can’t wait to receive my copy! 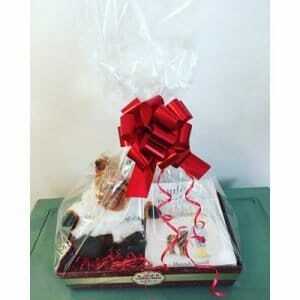 This adorable hamper is perfect for the horsey child. It includes Hannah’s first book, the magic helper as well as your very own Little Alf cuddly buddy and a few other Little Alf goodies. What could be better than getting your little ones tucked up into bed with a story about an adorable cheeky pony with their very own pony to cuddle? 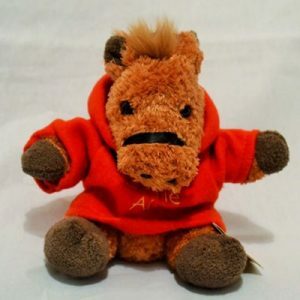 The cuddly Little Alf buddy is the perfect companion for the pony mad or Little Alf lover! This high quality cuddly toy comes in various versions, the original and multiple limited editions (which you need to grab while you can as when they are gone they are gone!) Little Alf Buddy loves days out and holidays and if you take photos of him when you’re out and about you can win the yearly competition! Read my review of my Limited Edition Little Alf Buddy. It is Christmas Jumper season and one jumper never seems to be enough when you consider all your work and social Christmas outings and events! So why not grab this adorable Little Alf Christmas jumper and really stand out from the crowd!